Sights of a timeless city. Personal tours of Pa­lermo with your own guide, at your own pace, and your own itinerary. 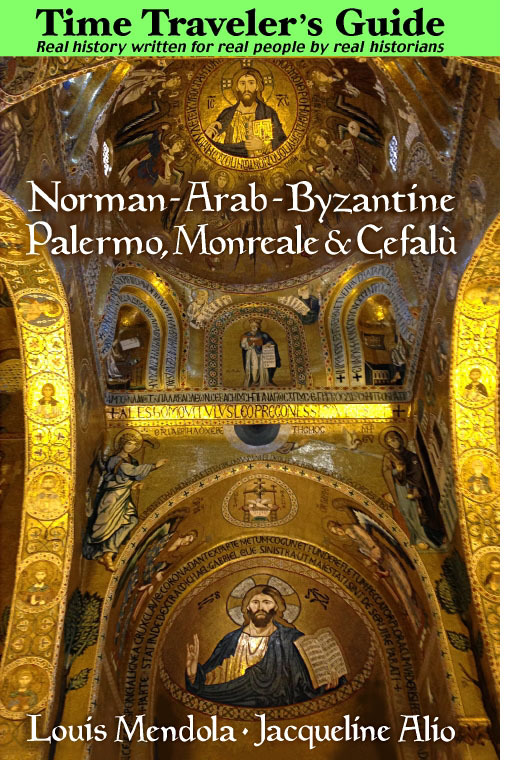 Palermo's Judaic her­itage is a hid­den legacy carved in stone. See it with an ex­clusive tour of Jew­ish Pa­lermo. Sightseeing and touring take many forms, and not every option is available in every locality of our fascinating island. Here are a few general guidelines to make your Sicily experience interesting yet trouble-free. For simplicity, we'll divide this page into several topics, but that doesn't mean we're suggesting "simplistic" solutions. We want to help you make the choices that are right for your style of travelling. These aren't "rules," just suggestions. The most important suggestion we can make is that you think about these details - even for a simple day-tour or 4-hour shore excursion - before arriving here in Sicily. A little planning can save you a lot of time once you arrive. In most cases, leaving the choice to a hotel concierge will not get you the best service. • Exploring Independently on Foot: In some localities this is the only way to get around; Old Palermo's labyrinthine streets and chaotic traffic make walking tours the best solution for most people. Siracusa's Ortygia district is another area best explored on foot. At large archeological sites (Agrigento, Siracusa, Segesta) you will have to do some walking. In Erice and Taormina many streets are closed to traffic, so you'll have to walk. You can do this on your own or with a guide. Granted that "hiking" isn't for everybody, physically challenged visitors should plan their itineraries carefully because most of Sicily's archaeological sites, and towns like Taormina, Erice and Cefalù, are on hilly terrain, with certain areas closed to traffic - and limited wheelchair access. Sightseeing independently can be rewarding, but it presumes that you have the best, most current guide book available. Think Frommers, Lonely Planet, DK Eyewitness, Blue Guide and Michelin Green Guide. • Driving around Sicily: This is ideal if you are travelling independently from town to town, or if you're staying in a hotel, guest farm or rental property (villa) from which you plan on making daily excursions. Just bear in mind the limitations that await you in certain localities (Taormina, Palermo), where you'll have to park the car before sightseeing. • Private Guided Tours: This is another approach to sightseeing that takes many forms. In some places (Palermo, Monreale, Siracusa, Agrigento) you might hire a tour guide for a walking tour which includes visits to certain historical sites and museums. Elsewhere, you may want to hire a guide and driver to pick up your group and accompany you on a tour of the sights. An obvious advantage of a private (personalized) tour is that it will focus on what you want to see. Here in Italy, licensed tour guides are highly-trained, scholarly, multilingual, experienced professionals. In addition to the page listing tour guides, we publish one (especially for travel agents) explaining the field in some detail. The best guides (with the emphasis on "best") know all the arcane "secret" details overlooked by even the best guide books. • Group Tours: Unless you're traveling with an organized tour of the entire island or a large chunk of it, a "group" tour could be a day tour or shore excursion to Taormina, Siracusa, Cefalù or the Palermo area (with Monreale nearby). It's important to reserve a place in such a tour before you arrive in Sicily. Never try to arrange it "on the spot" or after you've already arrived in Taormina, Catania or Palermo. • Taxis, Horse Carriages, 3-wheel Vehicles: Never get into a taxi without first "negotiating" the fare. The same principle applies to horse carriages, which we recommend even less. 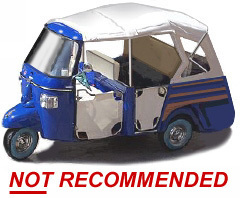 The option that we never recommend is the three-wheel vehicle (one is shown here). In other words, don't even think of boarding one of these vehicles - which is popular in Palermo - if you value your safety and don't want to be overcharged! We have an entire page dedicated to taxis and carriages. • Environment-friendly Transport: The historical district of Taormina, as well as Siracusa's Ortygia district, have large pedestrian or limited-traffic areas. The electric-powered quad vehicles in Siracusa are especially convenient and much safer than the 3-wheel vehicles (popular in Palermo) described in the previous section, and in our experience the drivers are more attentive to passenger needs. • Tour Buses: City Sightseeing operates these double-deck buses in Palermo, with occasional (seasonal) departures for Monreale. (See Palermo's transportation page has details.) This is a great way to see the historic part of town, stopping to visit the Norman Palace and other places of interest. A full-day ticket allows you to jump off a bus, visit a specific place, then board another later. There are stops around town near the more interesting points of interest. This obviously isn't the same thing as a personalized tour, but it's convenient if you want to see the sights without necessarily hiking around the city on a hot day. • Shore Excursions: These are similar to day tours. In practice, you have to get from the port (docking point) to the sights you want to see. From Messina, Catania or Trapani, this presumes ground transportation, and in that respect the excursions offered by the cruise lines are often convenient. In Palermo, however, the port is just a ten-minute walk from the historical district and there are sightseeing buses available, so unless you plan to venture farther afield (Segesta, Erice, Cefalù) there is really no pressing need to rely on the bus tours offered by your cruise agent. In any event, various firms (some advertised on this site) offer personalized excursions which for a group of five or six traveling companions are priced competitively to those crowded, impersonal offerings sold by the cruise lines. In the case of the city of Palermo (which is exceptional), a guide could meet you at the port for a private walking tour. If you are traveling on a private craft (a yacht), it's simple enough to arrange a private (personalized) shore excursion but - as always - we suggest arranging it before your arrival. • What to See: For quick sketches of a few ideas, our Top 12 Page is a good place to begin. • A Note on Public Transportation: Buses are not a problem in a large city or if you just want to get from Palermo to Catania, or from Catania to Siracusa, or into either Catania or Palermo from their respective airports. Trains are efficient for specific routes (Palermo-Cefalù, Messina-Taormina) but not for longer ones. Be warned that bus service to small towns can be inefficient. Check out our public transportation page for realistic advice. • Safety: This is especially important if you will be walking around a large city. It's considered on a dedicated page. Most of the self-serving "travel advice" for "tourists" offered by the Italian and Sicilian travel bureau sites should be ignored, especially as regards matters like traveler safety in public areas.